Ah, Silver Racquets Weekend! Even the most capable of writers – and your humble correspondent is most certainly not that – would struggle to describe its full glory. But follow along, if you will, as some attempt is made to capture the essence of a fantastic weekend, as recounted by the surviving brain cells of the author. Coming from near and far, the group of merry racketeers and supporters gathered after the early rounds of matches for the inimitable New York Racquet & Tennis Club Thursday Night Stag Dinner. The fantastic meal, wonderfully paired with delicious wines, was quickly dispensed of, making way for official words of welcome from NARA President Mike McLernon. Despite his lack of a teleprompter (blame the NARA communications director for that), el Presidente managed to correctly identify three of the four players in the World Championship Doubles Challenge, and provided an update on the state of the game in North America. To that end, all were pleased to hear about the developments concerning the ball machine, shipped to Chicago the previous spring and already in full production to supply all seven clubs. As is his habit, James Coyne stood to kick off the storytelling, encouraging others such as Charlie Foreman to share their own jokes. Christopher Scott fished out an old classic that we could not kelp but laugh at, and a determined bunch then made way to another old classic, Dorrian’s, to continue the revelry. Once there, they knew that they would not be swimming upstream, as in came a large and well-heeled contingent from the Met Gala, allowing the racketeers to blend in sufficiently to steal a few of their dates. Like shooting fish in a barrel! Matches continued on Friday morning through the evening cocktails, when groups splintered off for dinner on the town. Several gathered at PJ Clarke’s, while others preferred to congregate at Bar Belly before being led to some derelict dive bar. There concluded the evening for most, though a select few soldiered on, only to be found resting their weary eyes on the R&T locker room couches the following morning. Saturday made way for the First Leg of the World Championship Doubles Challenge, featuring the young British challengers Tom Billings and Richard Owen facing off against Jonathan Larken and James Stout on their home court. Do not let the location of match fool you; Messrs. Billings and Owen travelled with a large contingent of fans – many with the surname Billings, funnily enough – so there would be no home crowd advantage if the Brits had anything to say about it. Age was a frequent topic of conversation leading up to Saturday’s match, with many in the crowd wondering if Larken would be able to keep up with the two young challengers. The Champions are the Champions for a reason, after all. They are Stout and Larken; they’ve been there and done that, and their collective experience competing in the rarified rackets air for so many years did leave them as the clubhouse favourites to take the First Leg, if not the Championship altogether before the first ball was hit. But one look at the pair of Billings and Owen left no doubt that they came to New York with every intention of winning. Observers of training matches noted their impeccable fitness level, their speed, and their power. For the first time in recollection A.S. (After Stout), the bookies were confused. “Difficult to call who’s going to win this one,” opined Neil Smith, a former 5-time world doubles Champion commentating on the live feed along James Zug. After a quick knock up from both sides, referee James Coyne reminded the crowd of the importance of Rule 16, the crowd roared, and marker Barney Tanfield commenced the proceedings. Perhaps having heard the murmurs of the crowd or simply benefitting from his strict training regimen, Larken quickly laid to rest any notion that he could not keep up with the challengers’ furious speed in the first game. Stepping up the court and hitting one perfect volley after another, he left the crowd wondering what, exactly, they were putting in that water up in Greenwich, Connecticut. Buoyed by his efforts, the defending Champions won the first game 15/6. The second game featured some furious rallies as the Challengers’ nerves began to settle down. Winning back the serve, they jumped up to an early 3-0 and later 5-2 lead on the back of Billings’ aggressive play and Owen’s powerful shots. Undeterred, the champions kept their cool throughout some long points and sooner than anyone could notice there was Stout serving up 12-5. After a brief change of hand, the Champions finished off the challengers in the second game 15/5. With the scores belying how close the first two games were, nervous supporters of the Challengers shouted encouragement as the contestants returned for the third game. Both Billings and Owen seemed loose despite a first point ace from Stout, and as Tom took to the service box he responded with an ace of his own. Then came Richard Owen to put on an absolute clinic from the service box, leaving the challengers up 5-1 before relinquishing the hand. 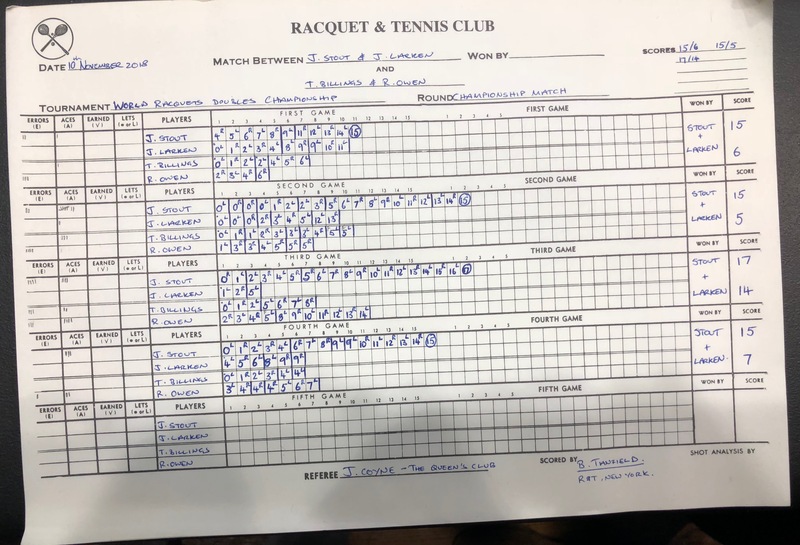 Sensing that Stout was beginning to heat up as he levelled the score 5-5, the Challengers capitalized on a rare error to regain the serve and ramp up the pace. Billings blazed around the court with great speed and Richard Owen, ensuring that his name would never again be forgotten, showed off his tremendous serve forcing a game point at 14/5. Alas, a cheeky frame shot from Larken’s racket put the defending Champions back in the service box, which they would not relinquish. Jonathan, showing himself no worse for wear after a collision that briefly left him writhing in pain, played tremendously well, but it was Stout who stole the show, leaving no doubt that he is more than deserving of the Greatest of All Time moniker. In a heartbreaker for the young bucks, the defending Champions grinded out the third game 17/14. The resilient Challengers were first to take the court for the fourth game, determined to keep up the good fight. With all of the pressure squarely on their shoulders in this best-of-seven First Leg, they showed early jitters but settled down quickly. They belong on this stage and that last game proved it, but they would have to be perfect now. While the much-discussed age difference did indeed prove to be a factor at the tail end of the match, its effect was not quite as predicted. The young bucks still had plenty of energy, sure, but it was the Champions’ experience that shone in the last game as they played loosely and displayed fabulous chemistry built over years of training. In the fourth iteration of Unstoppable Force vs Immovable Object, the Champions claimed the match 4-0 with a final game score of 15/7. 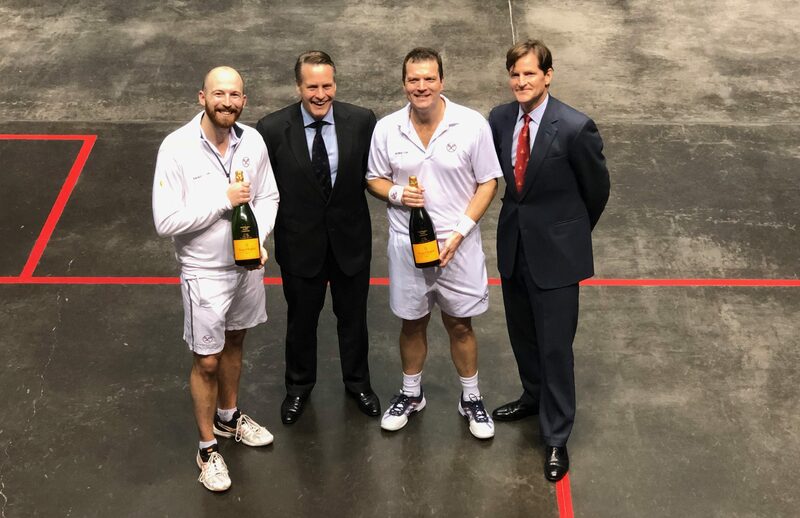 The body language of both pairs told the tale of the match when Christopher Scott and Mike McLernon trotted on court for the final presentation. The Champions were absolutely exuberant as the the Challengers leaned quietly against the side wall, competitive fire burning within them. As Larken noted, however, young Billings and Owen had absolutely no reason to hang their heads; they played tremendously well and, had that third game gone another way, it could have been an entirely different match. One thing is certain: the Challengers will put up a furious fight in London, and it will be a delight to watch. On to the Queen’s Club! The famous Saturday night Silver Racquets Ball once again showed why it is the best party in New York with well over 500 in attendance for dinner, most remaining for the late night festivities. Surrounded by Gotham City’s most beautiful people, Louis Winstanley’s flair on the dance floor could not be missed. What Stout is to rackets, Louis is to dancing – or so he thinks – and a good time was had by all until the wee hours of the night. 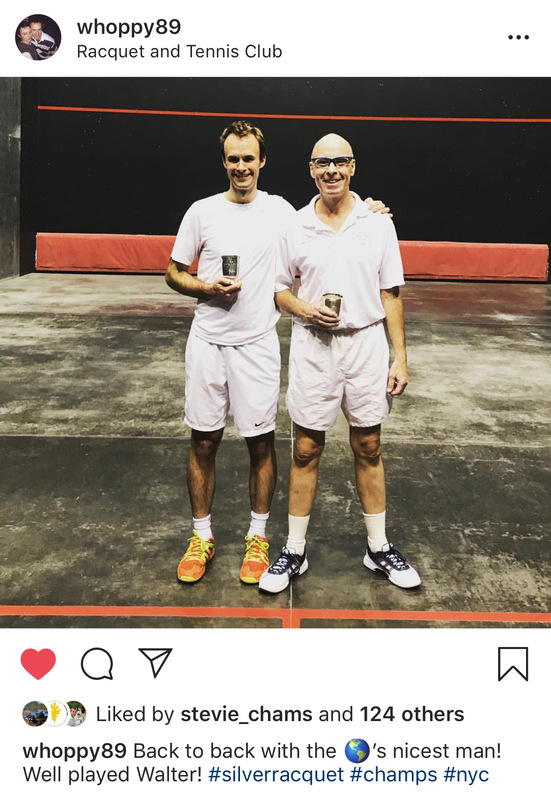 The much coveted 25th Silver Racquets Rackets Doubles Championships went to the pairing of Walter Deane and Will Hopton, repeating the previous year’s feat. Congratulations to both on a tournament well played! Finally, many thanks to the R&T Pro Shop and staff who worked tirelessly to ensure that a splendid time was had by all throughout the busy weekend.